nice good outdoor ptz camera,install one for my factory use,great wide angle view,and capture high resolution image without any vague,support it . This optical zoom ptz camera is very nice,pan and tilt wihtout any problem,but have to buy a controller seperately,like to have one with joystick so that i can control it remotely. 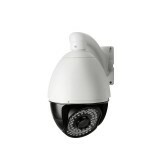 This 22x ptz camera price is acceptable for its amazing function and high performance! !t worked quite well with my dvr,i can look around my house,garage,fantasitic!! This camera can pan,tilt and zoom,a full view of my home around can be seen, I like it very much,want to buy one more for my business working environment. 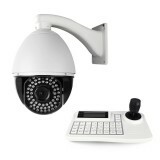 We offer a few selections of pan tilt zoom cameras (PTZ camera) for our customers. Unlike other usual security cameras, A “PT” camera has the ability to remotely pan and tilt. A “PTZ” camera has the ability to pan, tilt, and zoom. 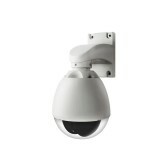 These PTZ cameras can move left to right, right and down, zoom in and zoom out via a computer, DVR or PTZ controller. If the end user intends to connect all pan tilt cameras or PTZ cameras to a DVR, then a PTZ controller is not necessary unless that end user needs to be able to manually move more than one camera at the same time. This type of camera can monitor all directions automatically and repeatedly scan 360 ° endlessly, change the angles to look at the items either above or below the camera, and zoom in to get more details from the items. Our PTZ cameras feature IR night vision, high speed, weatherproof, an upgraded new menu function, some have presets that can be set for key monitoring areas when the user is not near the keyboard.The PTZ camera systems are very popular among businesses, military and law enforcement agencies for surveying products or public areas. This is the best all around solution for security needs.